Raman Singh, who is eying a fourth term as chief minister, said Chhattisgarh has developed on all fronts contrary to what the Congress party claims. 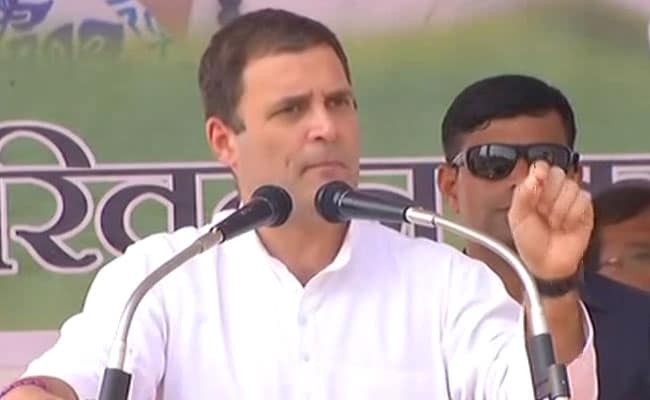 Launching a scathing attack on Rahul Gandhi, poll-bound Chhattishgarh's Chief Minister Raman Singh on Saturday alleged the Congress chief was "sort of an entertainment" for people in the state and his campaign could be detrimental to his own party. Ahead of the crucial first phase of voting in the state on Monday, Mr Singh said Rahul Gandhi does not know anything about Chhattisgarh and his rallies would not help the Congress draw any significant votes. Mr Singh's counter-attack came a day after the Congress president, during his election campaign on Friday, accused Mr Singh of indulging in graft and of doing any work only after taking "permission from his 10-15 industrialist friends". "Rahul does not know anything about Chhattisgarh. People of Chhattisgarh do not take him seriously. He is sort of an entertainment for them," Mr Singh told PTI in an interview. Mr Singh, who has been chief minister of the tribal-dominated state for a record 15 years out of its 18-year history, said Mr Gandhi's presence in the state would not dent poll prospects of the BJP, but might prove detrimental to his own Congress party. While there was no immediate comment from the Congress on the latest jibe at its party chief, the allegations levelled by various political parties have often become personal amid a rising election fever in the country's political landscape. While the Congress has been accusing the BJP-led governments at the Centre and in various states of indulging in crony capitalism, Mr Gandhi has launched an aggressive campaign centred around these charges for the five poll-bound states, including Chhattisgarh, which are being seen as semi-finals before the 2019 Lok Sabha elections. The BJP has denied these charges and have levelled counter-allegations of corruption and crony-capitalism being things of past when the Congress was in power. Mr Gandhi has been actively campaigning in Chhattisgarh where voting will be done in two phases - on November 12 for 18 seats (including 12 in naxal-affected areas) and on November 20 for the remaining 72 seats. Voting in MR Singh's own constituency Rajnandgaon, where the Congress has given ticket to late Atal Bihari Vajpayee's niece and former BJP leader Karuna Shukla, will also take place on Monday. During his campaign rallies on Friday, Gandhi had hit out at Prime Minister Narendra Modi and Chief Minister Singh over various issues, including lack of development in Chhattisgarh. Mr Singh, who is eying a fourth term as chief minister, said Chhattisgarh has developed on all fronts contrary to what the Congress party claims. "Chhattisgarh used to be a backward stage. In 15 years of the BJP rule, it has become one of the developed states. We are growing at a great pace and will soon be along top five developed states of the country," he said. To a question on whether the BJP will lose votes due to an alliance between former Chhattisgarh Chief Minister Ajit Jogi-led Janta Congress Chhattisgarh and Dalit leader Mayawati's Bahujan Samaj Party, Mr Singh said the BJP's vote share will remain intact despite the formation of this "selfish coalition". "It is a selfish coalition and both the parties will not have any effect on the BJP votes," he said. On the menace of Maoism, Mr Singh said Maoists in the state were living on life support. "We have neutralised Naxalites and their agenda with our development work. Maoists in the state are living on life support. It will soon be over," the chief minister said. The 66-year-old BJP veteran, who was a practising ayurvedic doctor before taking the plunge into politics in 1980s, became Chhattisgarh's chief minister in December 2003, after the saffron party snatched power from the Congress just about three years after the state was carved out of Madhya Pradesh. In the 2013 election, the BJP got 49 seats while the Congress secured 39. The BSP got one, while one seat was won by an Independent candidate.